Letterpress Edition Text: Photopolymer plates typeset in Univers; Images: Letterpress printed engraving plates & linoleum cut blocks with hand painting; Paper: Stonehenge & Thai. Bound in gold book cloth inside a deep ochre slip cover. 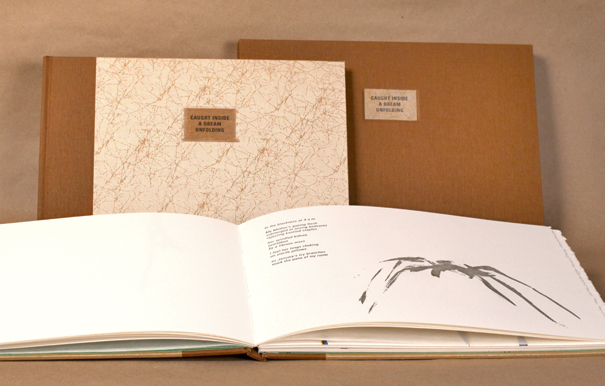 Poem, images, printing and binding by the Artist. 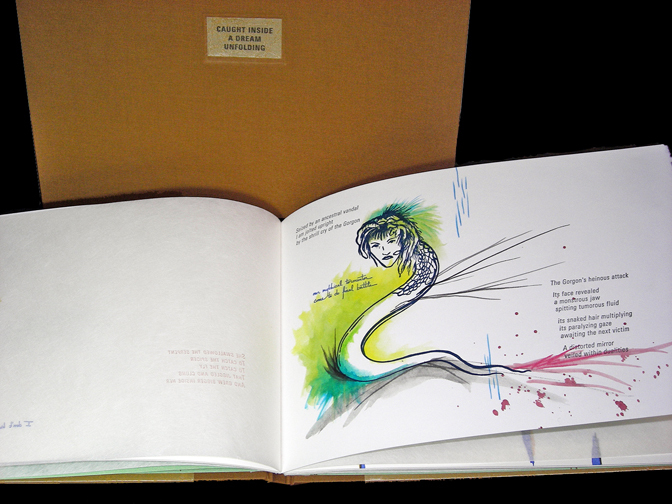 Through poetry and images, Caught beautifully weaves the story of the artist, her Mother, and the mythical Gorgon, representing the cancer that took her Mother’s life. The edition communicates a powerful struggle both psychological and physical, involving intense feelings and intimate memories, past pain, present healing, and future hope. . . . wishes, dreams, transformations . . .